There’s a lot of talk about how to make our food supply more sustainable. And, increasingly, eaters connect the dots between a healthy diet and a healthy planet. One line of evidence? A shift on grocery store shelves. A farmer in India piles millet in a field. Grains such as millet and sorghum pack a powerful nutritional punch, but they are overlooked for calorie-laden commodity crops such as wheat or maize. At my neighborhood Safeway, veggie dogs were once hard to find (tucked in the back of the produce aisle). Now, there’s an expansive section of plant-based protein products, including vegan cheeses and sausages. As sales of plant-based proteins rise, there’s growing awareness of the ecological footprint of beef production. Who knew it could take about 50 gallons of water to produce a 1/4 lb hamburger? Sustainability goes beyond food production. Last year, Unilever committed to using 100 percent recyclable or reusable packaging by 2025. Nestle has made a similar pledge. These companies, along with other big players — including Mars and Danone North America — have formed a new trade association called the Sustainable Food Policy Alliance, which aims to focus on issues such as nutrition, sustainable agriculture and renewable energy. This week, foodies will put sustainability issues on center stage at the International Forum on Food and Nutrition. The summit, organized by the Barilla Center For Food and Nutrition, coincides with the meeting of the U.N. General Assembly, where the Sustainable Development Goals of “Zero Hunger” and healthier diets will come into focus. I spoke to Danielle Nierenberg, editor of the book Nourished Planet, which includes ideas aimed at reducing hunger, obesity and food waste, as well as ways to promote more nutrient-dense crops. The U.S. comes out 21st out of 34 countries on the Food Sustainability Index. This index ranks countries based on three pillars: sustainable agriculture practices, nutritional challenges, and food loss and waste. France comes out on top. Why is the U.S. so far behind? One, we don’t have a concerted government effort behind sustainable farming practices like some other countries do, including France. And second, and this isn’t really in the data provided by the index, I think Americans continue to be far removed from how and where their food is grown. It’s easier for Americans to ignore the true costs of how their salads, hamburgers or any other food is produced. Some of the biggest challenges facing the globe are connected to what we eat and what we grow. What changes are needed? What we outline in Nourished Planet is some of the things that are working to alleviate those problems, such as a return to indigenous and traditional crops and trying to elevate the stature of foods that have been thought of as “poor people” foods. Some of these food hold a lot of capacity to improve nutrition and help create resilience to climate change. One example: grains such as millet and sorghum. A lot of people refer to them as ‘bird food’ because they’re very small grains, but they pack a real powerful punch in terms of nutrition. 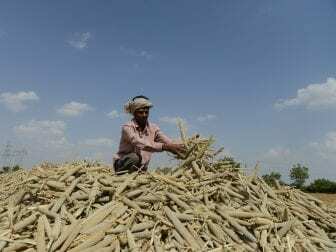 They have been overlooked in favor of commodity crops like wheat and maize that help fill people up in terms of calories, but aren’t as good in terms of nourishment. It’s about having a diverse food system that’s not dependent on one or two [grains]. In the U.S., families toss out an estimated $1,600 worth of food per year. We’ve reported a lot on how much food goes to waste in the U.S. Does the book outline some solutions to food loss and food waste? We outline some solutions to food loss and food waste. The onus has been put on consumers who buy too much, but there are also a lot of solutions that can happen on farms to prevent post-harvest losses. Better infrastructure, better storage. Simply, better roads can really help farmers get their crops to market more quickly. So, we try to cover a range of solutions that can help farmers do their jobs better. I want to talk about an obstacle that may not be at the top of people’s minds when they think about the food system: the gender gap. For instance, in a series of stories I did about attempts to empower women on coffee farms, I witnessed how much of the work is done by women. But, often women don’t control the resources and are not empowered to make decisions. Is this a global issue? Absolutely. We ignore women in the food system at our own peril. Many studies show that if women had the same access to resources, including education and land, they could improve food production by 20 to 30 percent — and lift millions of people out of hunger. When we think of farmers, whether it’s in sub-Saharan Africa or Iowa, we think of men. And that needs to change, because it’s women who are producing so much of the world’s food. Is there a leader who has inspired you, in terms of shining the spotlight on gender inequality? One in particular, and it happens to be a man! That’s the former U.N. special rapporteur on the Right to Food, Olivier De Schutter, who has done such an amazing job on shining a spotlight on how gender roles need to change in agriculture, and in all aspects. I look to him for that visionary thinking. For instance, he points out [in this report] that while women account for about 80 percent of the labor force in agriculture, they own less than 1 percent of land, and account for less than 1 percent of credit offered to farmers around the globe. There’s a lot of talk about improving nutrition. Currently, we have a food system that relies heavily on a few crops such as corn, soy and wheat. The Union of Concerned Scientists has an infographic, called Plant The Plate, that points to the disconnect between what we’re told to eat (more fruits and vegetables) and what farmers plant. Do you think it’s important to expand the range of foods we grow and eat? Yes, we’re not growing a diverse plate at all. Farmers are locked into a cycle around the world of growing those commodity crops. I think one thing people don’t realize is that there are so few players involved. Just a [handful] of companies control so much of what we all eat — and that has serious repercussions not just for the economy by for our health. We’re misled by the abundance we see in the supermarket, and we don’t realize [the control] that a few companies have in deciding what we eat everyday. Do you think there’s more awareness — or growing interest — in animal welfare? Absolutely. People are beginning to understand that if we’re dosing animals with antibiotics, that can impact [human] health as well. And there’s more awareness of animal welfare and social justice issues. We want to eat food that doesn’t abuse workers or people. And I think that consciousness is growing.